What do I have in my Pantry? So…the other day as I was reorganizing my kitchen, I realized that I have a ‘few’ canned items that I have had with me for awhile now…these items included canned tomatoes and chicken broth. I thought…hmmmmm what can I make out of this and discovered that I should try making my own home-made tomato soup. 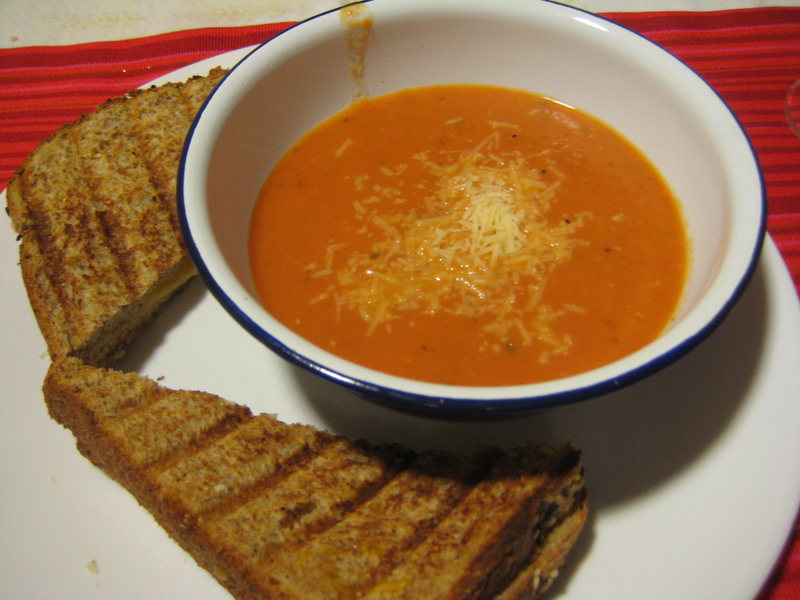 One of my FAVORITE comfort foods is tomato soup of course paired with grilled cheese sandwiches. I have always been of the Campbell‘s variety but I decided it is time to try it on my own and of course share with friends! 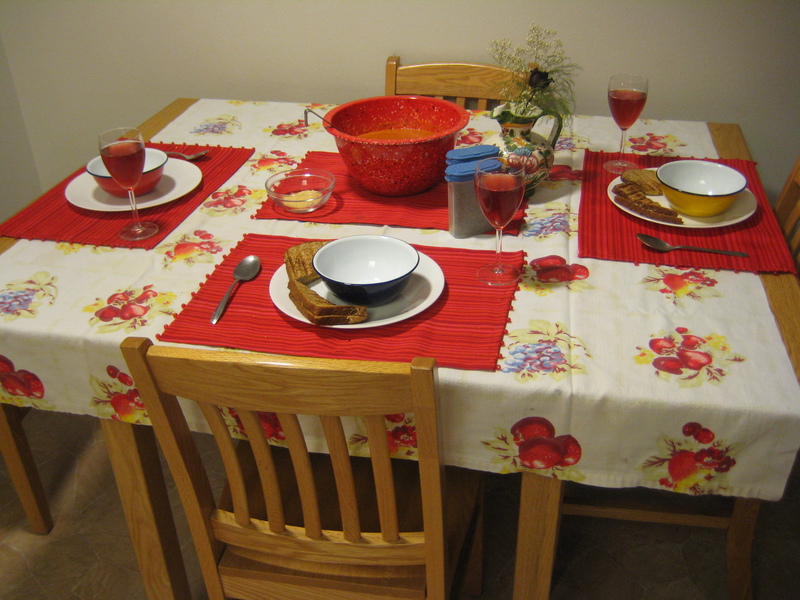 I even used the tablecloth and place-mats that my mom gave me! And took out glasses to do a cranberry spritzer with cranberry juice and lemon-lime pop! SOOO HAPPY I tried this out!!! And of course, I had the help of Tope and some other good friends. Friends, soup, and cheese = wonderfulness! After searching through massive amounts of recipes, I finally settled on this one, thanks to a one mahalo.com website. To find that website you can follow the link and take the recipe there. As for us, we modified a little to our own liking so here it is below! Home-made Tomato Soup from Canned Tomatoes! Chop your onions and mince your garlic. Then saute them in the butter on the stove-top. Once the onions are translucent, add the tomatoes, chicken stock, basil, milk, tomato paste, and salt and pepper to taste. Bring the soup to a boil and then turn the heat down to low and let simmer for 20 minutes. Then if you have an immersion blender, blend the soup right in the pot. Otherwise, with a blender in batches, blend the soup! Then serve with of course grilled cheese sandwiches and voila!!! A deliciously, simple tomato soup!!! -See you in the kitchen! Your table setting looks beautiful! But of course I love the color RED. The tomato soup sounds easy to make and looks divine. Love ya, Mom.